So it’s that time of the year again – when all right-thinking southrons celebrate the solstice by having lunch outside or next to the pool, and think fondly of all those poor folk who can’t go outside for long where they live. – Pete Meissner, who made it a very special year for me. You know what you did, bro. You done good. Thanks! – And to Dr Iris, and that cogitating pachyderm: here’s hoping for tenure!! Really! – Finally, the lump-of-coal awards: first, to that excitable person with the keyboard-using equivalent of Tourette’s Syndrome, who can’t spell; second, to nicoleandwhosis – no tenure for you; you leap to conclusions not based on evidence MUCH too fast. And to everyone (or nearly everyone) – a great 2012!! This entry was posted in Personal stories and tagged Henry Gee, Womanspace. Bookmark the permalink. Good blog Brother. And the finest of southern solstices to A-L et you. Appreciate the comment. May all our wishes for a wind farm on Pinelands oval be realised. May the solar waves warm our pool to a temp even I can enjoy and may only the good viruses invade Uitvlugt. 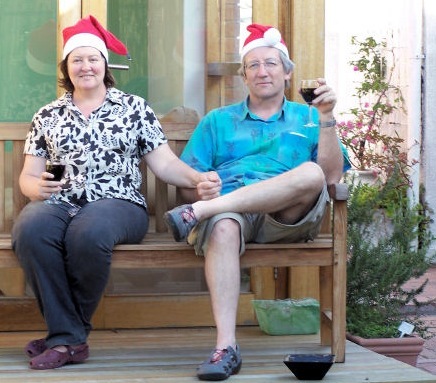 Blessings over Christmas – from somewhere in the Southern Cape.